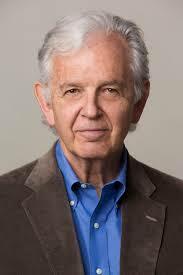 Love stories – but of the doomed and/or selfless and/or tragic variety – were the theme, said Music Director Eckart Preu, of most of the pieces comprising the penultimate Long Beach Symphony concert of the 2017-2018 season. The exception was Mozart’s Violin Concerto No.3 in G major K.216, which was given a vigorous and thoroughly involved performance, full of dynamic contrast, by the American violinist Benjamin Beilman with an LBSO that, though its string section was appropriately scaled down to something like 8-6-4-4-2 (so far as I could see) to match Mozart’s slender wind forces, nonetheless delivered a “big orchestra” sound under Maestro Preu. This was spontaneous, alive Mozart, far removed from Dresden china wallpaper (to mix a couple of metaphors). The muted strings at the opening of the Adagio conjured a background of prayerful intimacy against which Mr. Bellman’s probing but not overtly sweet-toned playing kept concentration focused on the line of the music. As with the opening Allegro, the modest, shapely cadenza he played (his own?) was in keeping with the movement’s intimacy. The final Rondeau remained beautifully airborne despite its relatively measured pace, with an improvisatory freshness throughout. Its central Andante episode was as irresistibly wistful as ever, while Mozart’s throwaway “that’s all, folks” ending on its cursory-seeming upward flick on the oboes and horns, as ever, momentarily wrong-footed the audience. 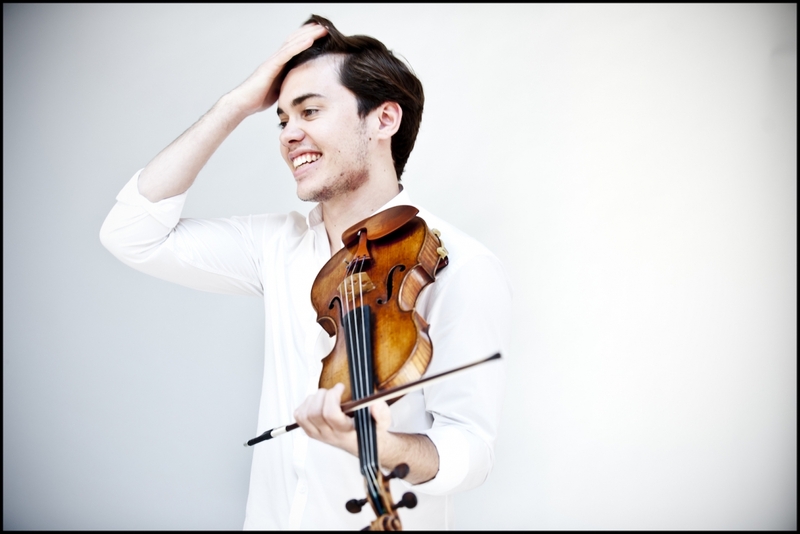 For an inside view of the performance from a player’s perspective, don’t miss LBSO violinist Laurie Nile’s wonderfully insightful blog post. I wish I could now find chapter-and-verse for the story told (I think) by André Previn about the approach of some maestro of yesteryear to the notoriously difficult opening of Strauss’s Don Juan Op.20: to take the orchestra by surprise so that the unison fortissimo strings’ Allegro molto e con brio came out as a kind of torrentially messy and desperate upward surge that set the neurotic tone for the whole performance. Maestro Preu’s handling of it couldn’t have been more different. Even though Don Juan was the first item on the program, with the orchestra “cold”, it got off to a splendid start, not precipitously fast but clear, urgent, and together. The whole performance followed through from that opening – at around 18 minutes with plenty of time to breath, characterful wind solos in the tranquillo interludes, and at the final climax before the Don’s virtual suicide at the hands of a father avenging his daughter’s honor (in the version of the story taken from Nikolaus Lenau), first the horns and then the massed strings gloriously carrying the anti-hero’s theme above the remainder of the orchestra. 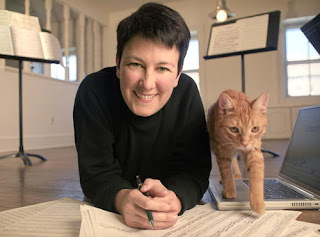 Jennifer Higdon and her cat Beau. If the love story – if it thus can be called – in Don Juan is one of doomed selfish obsession, then the love enshrined in blue cathedral, composed in 1999 by the contemporary American, Jennifer Higdon, could hardly be more different, selfless, and tragic. Its subject matter, a meditation upon the death of the composer’s younger brother through the vision of an aerial cathedral of blue glass, inevitably recalls that of another Strauss tone poem, Death and Transfiguration, but Higdon’s approach and soundworld could hardly be more different from Strauss’s. The work grows out of a kind of sigh – downward pairs of chords played by two violas and two ‘cellos against a soft, rather Schrekerish, tintinnabulatory background on tuned percussion – through a central passage of timpani-driven anger, to a transcendental hushed conclusion, sounded by many small Chinese health reflex balls being gently shaken by dozens of orchestral players. Maestro Preu and the LBSO gave this also a spacious and devoted performance, as if it were as much a repertoire piece for them as the Strauss, allowing the intricate beauties of Ms. Higdon’s orchestration to tell clearly. I felt that in places the work marks time a little, relying on the intoxicating quality of soaring, shimmering string writing – slightly reminiscent of Michael Tippett – but which doesn’t really go anywhere in particular. However, overall blue cathedral is a concise, beautiful, and immediately affecting piece, and it was no surprise that the near-capacity Long Beach audience greeted it with as much enthusiasm as it has surely received from others for the astonishing c.600 performances it has so far received. 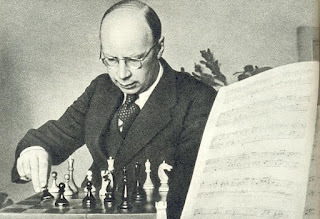 Prokofiev in 1936, playing chess. Finally, perhaps the most familiar love story of all – Romeo and Juliet, as envisioned in music by Prokofiev. Maestro Preu chose not to go with any one of the three suites which the composer extracted from his massive score in 1936 and 1946, but rather five of the ripest plums from Suites 1 and 2 – “Masks”, “Romeo & Juliet” and “The Death of Tybalt” from Suite 1, and from Suite 2 the familiar “Montagues and Capulets” to open, and “Romeo at the Grave of Juliet” to close. 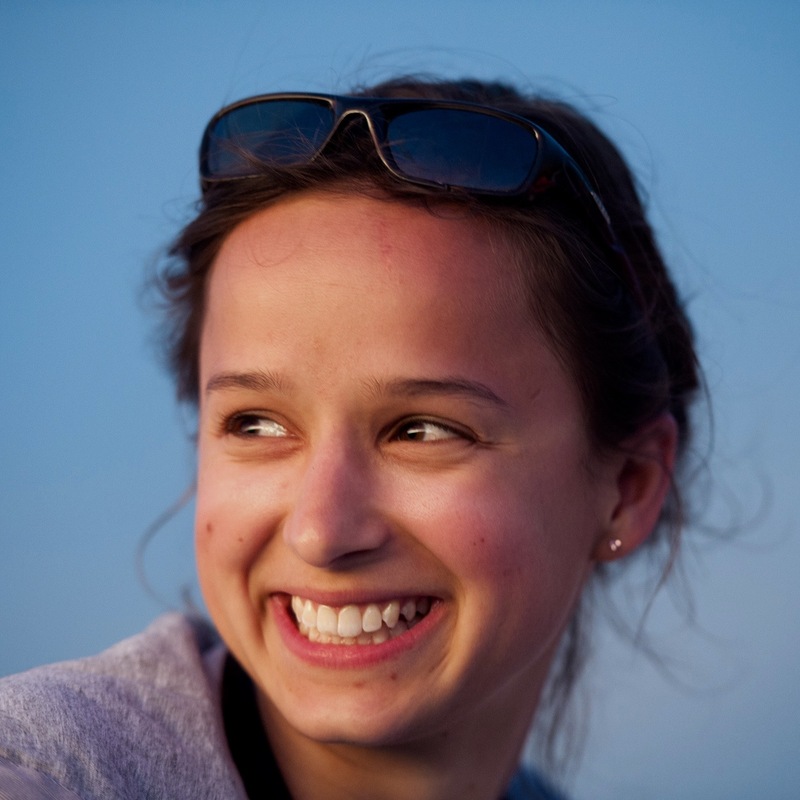 Has Prokofiev’s Romeo and Juliet become rather overdone in concert programming? I think so: there is so much other fine music by this composer that is still rarely programmed. However, if you’re going to include it, you could hardly have made a more juicy selection and given it with more verve than it was done here. Long Beach Symphony Orchestra, Terrace Theater, Saturday, April 28, 2017, 8 p.m. Photos: Benjamin Beilman: Performer website; Richard Strauss: Frederick Müller, Munich; Jennifer Higdon: Candace DiCarlo, courtesy wrti; Prokofiev: Courtesy Chess History. with Andrew Staples (tenor), perform Elgar’s The Spirit of England. During my London concert-going decades, before moving to the USA in 2004, one favorite venue was the Barbican Hall in the City. Following its opening in 1982, the Hall’s acoustic along with other design aspects of the whole Barbican Arts Centre came in for a good deal of stick, but I always found it an exciting place to listen to great music (the acoustics had some remedial work in 1994 and 2001). One major highlight was the series of Berlioz concerts in the 1990s and early 2000s under Sir Colin Davis, from which two complete performances of Les Troyens stand out particularly. So on a family trip to the UK in April, it was a pleasure to be back in the Barbican Hall at a rather special concert by the BBC Symphony Orchestra under their Conductor Laureate Sir Andrew Davis (no relation to Sir Colin), whose work with the BBCSO goes back some 30 years to when he was its Chief Conductor. 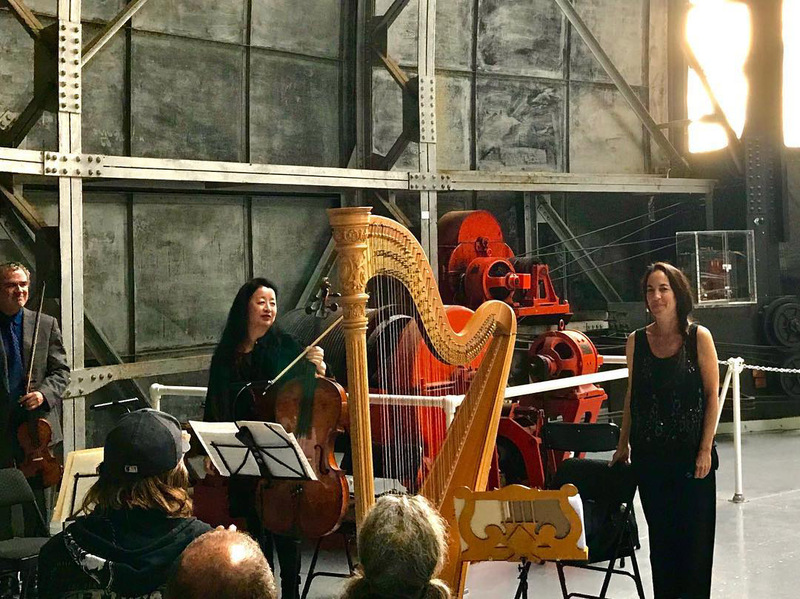 Three of the four works reflected the fact that the concert was inspired by the centenary of the end of World War 1, though somewhat tangentially in the case of the first. In autumn 1915 Elgar – aging, “not liking music at all” (according to his wife’s diary), and haunted and depressed by the war – was approached to compose incidental music to The Starlight Express, a play drawn from A Prisoner in Fairyland, a novel by the great writer of mysticism and the supernatural, Algernon Blackwood (1869-1951). Elgar responded wholeheartedly to its message of “sympathy” (aka empathy) through the redemptive agency of childhood, and within a month had written around 85 minutes of music – some 50 individual numbers including both settings of verses in the play and orchestral fragments to underline the action – in time for the premiere on December 29, 1915. But while the novel is an allegorical fantasy of some complexity, the play necessarily devolved onto the main plot thread (in bald synopsis, a tissue of dated escapism verging on tweeness). 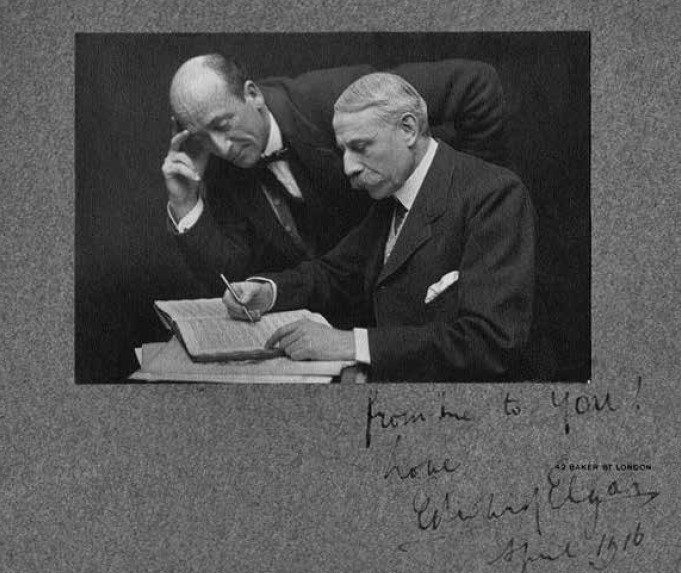 Both Elgar and Blackwood, who became close friends, considered the production pretentious and over-sentimentalized, critics picked it apart, and it closed after only a month. 18 February 1916. The inscription reads ‘from me to you! Love Edward Elgar April 1916’. The one success was Elgar’s music, from which he conducted eight numbers for his first major recording session as soon as February 1916. The play has never again been staged in its entirety but extracts from the score have often been recorded, as well as its entirety twice, under Vernon Handley in the 1970s, and in 2012 by Sir Andrew Davis himself. The program book for this concert promised five vocal numbers, but Sir Andrew’s astute selection also included several of the brief orchestral items to bind them together, producing a virtually continuous suite running almost 30 minutes, that to me seems an ideal way to present the essence of this glorious score in concert. in the final moments of The Starlight Express. From the first measures his love for the piece and ability to invigorate his players were manifestly equal to his knowledge of it, launched here at a sparkling pace that outshone both his own and Handley’s recordings, with reduced string numbers to match Elgar’s theatre-scaled wind and brass forces only adding to the clarity. Keeping it moving like this fended off any tendency for tenderness to broaden into sentimentality, though it was impossible not to be touched by some exquisite string pianissimi, on the very edge of audibility, or to resist the emotional tug as Elgar’s final number surged into "The First Nowell", complete with bells. In the five songs, soloists Emma Tring (soprano) and Roderick Williams (baritone) were eloquent and heartfelt to match. Williams and Sir Andrew Davis. Roderick Williams returned to the platform for the one non-WW1-related item, the London premiere of The World Was Once All Miracle, settings for baritone and orchestra by Raymond Yiu (born 1973 in Hong Kong but now London domiciled) of six Anthony Burgess poems, and commissioned by the International Anthony Burgess Foundation to mark the centenary of the writer’s birth. Mr. Yiu’s settings had much orchestral invention (again with reduced strings), from onomatopoeic percussion in the first song, through bell-like, strings-dominated unease in the second, to a (to my ears) incongruous dance-band style finale. However, despite the alluring descriptions in the program note I found the word-setting as such – mostly angular all-purpose parlando with a larding of gimmicky syllabic repetition and whispering – to add nothing to the words, despite Mr. Williams’ skill and advocacy. The program note also managed to be unwontedly (maybe unwittingly) condescending about “Burgess’s own forays into musical composition” (the corrective is Paul Phillips’ ground-breaking biography A Clockwork Counterpoint: The Music and Literature of Anthony Burgess), and was curiously vague about the poems’ provenance: presumably their source was the 2002 collection Revolutionary Sonnets and Other Poems. 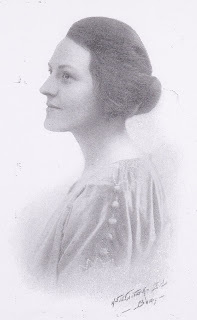 Lilian Elkington in the 1920s. After the interval, the orchestra was up to its considerable full strength for the return to the World War 1 theme. Before the main work, Elgar’s final choral masterpiece, The Spirit of England Op.80, came the short tone-poem Out of the Mist, composed in 1921 by Lilian Elkington (1900-1969), inspired by the arrival in November 1920 of the coffin of Britain’s Unknown Warrior, conveyed by destroyer across the foggy English Channel, en route to its final resting-place in Westminster Abbey. In the interests of full disclosure I should note that it was the present writer who discovered the manuscript full score of Out of the Mist in a long-defunct secondhand bookshop in Worthing, Sussex, some 40 years ago, and it has been a joy to see the work progressively taken up. 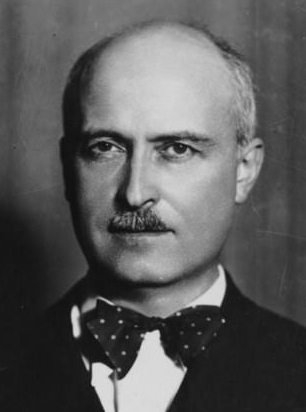 By the end of 2018, further performances in Spokane, WA, and Long Beach, CA, under Eckart Preu will have brought the total to double figures since it was first played by a student orchestra under Sir Granville Bantock, Elkington’s teacher, in the year of its composition. This account by Sir Andrew Davis and the BBCSO was cogent and powerful, and somewhat faster than the two CD recordings Out of the Mist has so far received (David Lloyd-Jones’ wonderfully spacious handling of it with this same orchestra on the Dutton label, coupled with The Spirit of England and other WW1-related works by F. S. Kelly, Parry, and Ivor Gurney in a program devised by British music guru Lewis Foreman, remains for me the benchmark performance). 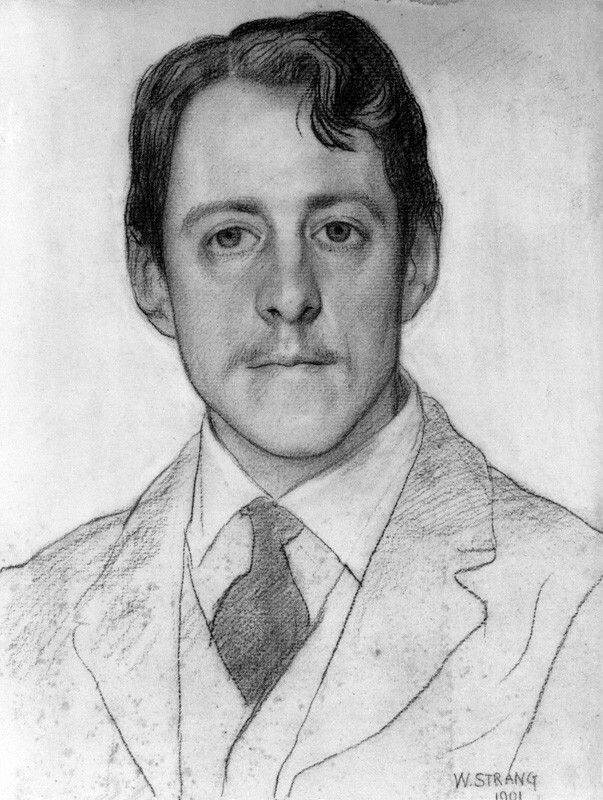 drawn by William Strang in 1901. Following the suggestion early in 1915 from his friend Sidney Colvin to “do a wonderful Requiem for the slain”, Elgar selected “The Fourth of August”, “To Women”, and “For the Fallen” from the poet Lawrence Binyon’s collection The Winnowing Fan, all written in response to the outbreak of war and which had been published in a single volume at the end of 1914. Elgar took the overall title of The Spirit of England from the opening stanza of “The Fourth of August”, but in fact “For the Fallen” was completed first, in June 1915. “To Women” was finished after the composition of The Starlight Express, followed by “The Fourth of August” – completing the concise, 25-minute cantata – in October 1916. Though “The Fourth of August” opens with a memorably upward-leaping surge of patriotism, the work as a whole becomes increasingly haunted and memorializing in tone, with valediction and funereal weight coming to predominate in “For the Fallen”, the longest and finest of the three settings. For this performance the BBCSO were joined by the tenor Andrew Staples and the BBC Symphony Chorus, whose brilliance and fervor at the outset, and hushed tenderness in the final moments, matched the pin-sharp responsiveness of their orchestral colleagues under Davis’s direction. This was one trip down memory lane that didn’t disappoint. BBC Symphony Orchestra and Chorus, Barbican Hall, City of London, Friday, April 13 2018, 7.30p.m. Images: The performers: BBC/Mark Allan; Elgar and Blackwood: Courtesy Chandos Records (© Arthur Reynolds Collection/Lebrecht Music & Arts Photo Library); Lilian Elkington: Author’s collection; Laurence Binyon: Courtesy Wikimedia Commons. Yes, I know there are some Los Angeles Philharmonic and other orchestral concerts amongst the Hollywood Bowl’s summer attractions, but if you’re looking for music that’s both smaller-scale and more out-of-the-way (in both senses), get yourself up to that other bowl in the San Gabriel Mountains, the inverted steel one that encloses Mount Wilson’s 100-inch telescope and which, on the first Sunday afternoon of every month from May to October, provides (now for the second year running) Southern California’s most distinctive music venue. I’ve a hunch that even with familiarity the thrill is never quite going to go away: after the long, twisting drive up the mountain you get the first glimpse of the great white dome in the distance and then, once parked and with the further half-mile walk uphill behind you (now slightly breathless from the near 6000-foot altitude), you reach the theatrical scene-setting inside. Climbing precipitous metal staircases to the observing floor brings you, now really out of breath, to the seating in semi-gloom… and then the dome aperture rumbles apart, light streams into the space, and with scarcely a sound or sense of movement, the whole dome/floor assembly, carrying the audience with it, slowly revolves into position. What a location! Roger Wilkie, Cécilia Tsan, and Marcia Dickson were enthusiastically applauded. 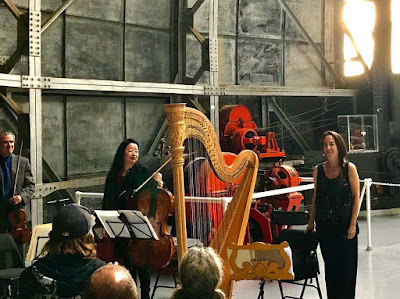 And so to the music, courtesy of Dan Kohne, Mount Wilson Institute Board of Trustees member and de facto director of development, and Cécilia Tsan, Artistic Director for these summer seasons and principal ‘cellist of the Long Beach Symphony. 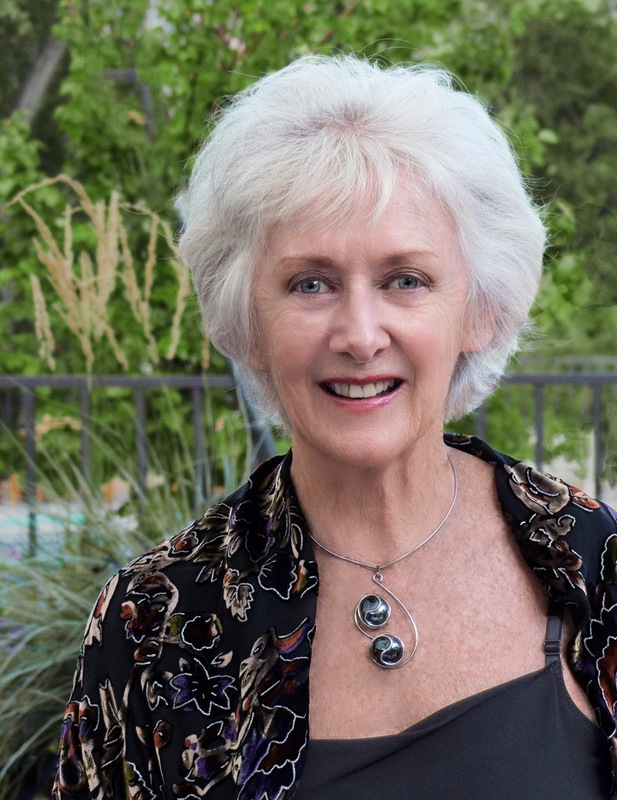 In this first concert she was joined by Roger Wilkie, the LBSO’s concertmaster, and harpist Marcia Dickstein, around whose instrument the program very much was constructed. First up were two 20th century French works, the Trio for Violin, Cello and Harp by Jacques Ibert and Saint-Saëns’ Fantaisie for Violin and Harp Op.124. The first movement of Ibert’s Trio, composed in 1944, has a strong unison opening from all three instruments: energetic, slightly unstable rhythmically due to its alternation of 6/8 and 7/8 measures, but of unclouded amiability (as indicated in the unusual marking Allegro tranquillo). It encloses a gentle, slower, middle section introduced by the harp, and this lyrical aspect is deepened in the exquisite slow movement, where a long and rapturously beautiful melody, first introduced by the ‘cello, is sung in increasingly ecstatic flights by the two stringed instruments against rapid dolcissimo chords on the harp. A short Scherzando con moto finale brings the work back to earth, but with the most thistledown of touchdowns. 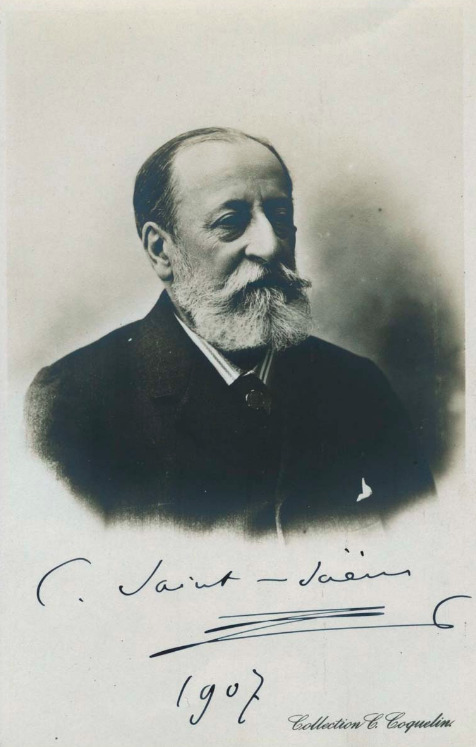 Saint-Saëns wrote his Fantaisie in 1907 at the age of 72 – fairly late in, but by no means near the end of, his very long career. Despite his already huge compositional output, the work carries not the faintest whiff of staleness; rather it sounds the work of a master composing purely for pleasure, to which Mr. Wilkie and Ms. Dickstein responded eloquently. 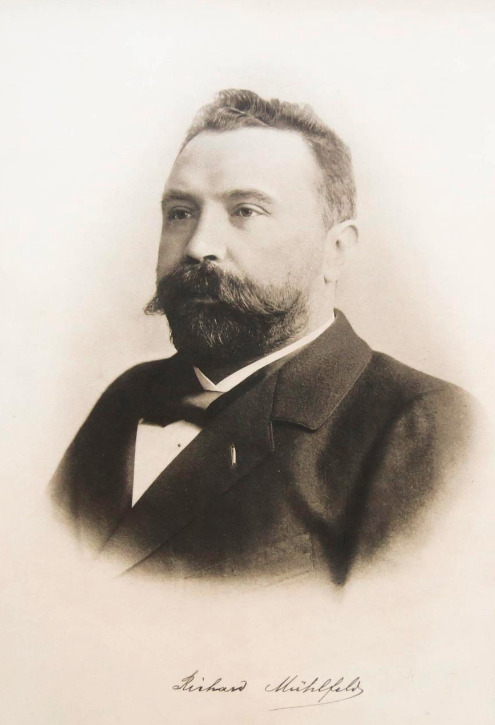 The Fantaisie’s five clearly delineated but linked sections flow without apparent effort each into the next, entirely side-stepping any hint of sonata-form though with a return near the conclusion to the opening melodic exchange between the two instruments, to tie the structural knot. Max Bruch’s Kol Nidrei Op.47 was originally composed as an Adagio on two Hebrew Melodies for cello and orchestra with harp, but has subsequently appeared in various versions. On this occasion Ms. Dickstein’s own arrangement for harp of the piano part in the ‘cello + piano edition rendered the accompaniment yet more plangent and soulful, while Ms. Tsan’s deeply felt account of the solo spoke eloquently of her long association with the work, she having played it for 13 consecutive years for Yom Kippur in the same Long Beach synagogue. 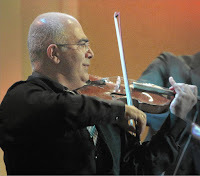 The slow, intense first movement was characterized by high violin harmonics, as if emerging from and then returning to stasis, as well as by strong arching unisons for both strings. Being quite short, it really acted as a prelude to the longer “Restless, but not too fast” second movement where the composer employs a wide range of playing techniques for all three instruments. It builds into a kind of moto perpetuo that keeps threatening to finish, but instead cranks up into yet higher a gear, so that in conjunction with the pervasive 3/4 time the effect brought to my mind’s eye (from a movie that Mr. Broughton was not around to score!) the nightmarish waltz as directed by “Mr. 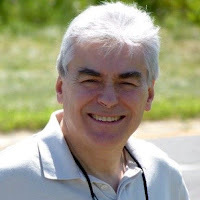 Scratch” in The Devil and Daniel Webster. This was a terrific start to the new season at Mount Wilson: to come are music for brass quintet on June 3, string sextets on July 1, string quartets on August 5, jazz on September 2, and to conclude, more string quartets (two of the greatest, by Schubert and Debussy) on October 7: details at the concert web page or by emailing concerts@mtwilson.edu. while 2018 celebrates the 150th birth anniversary of George Ellery Hale (1868-1938). 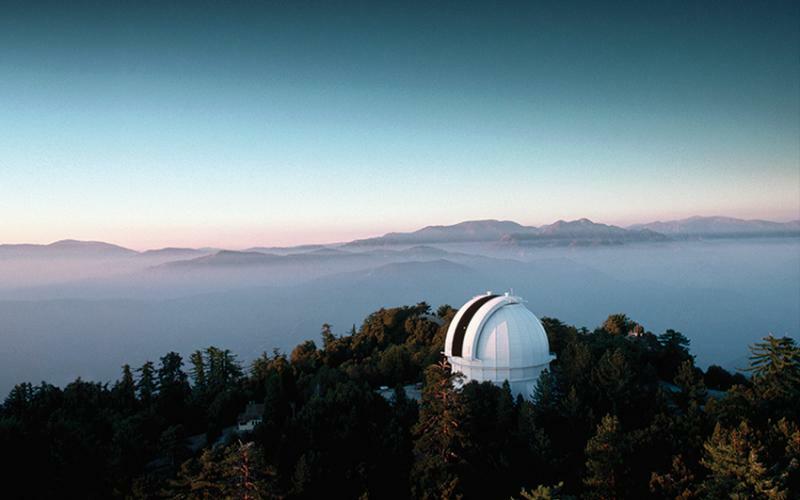 100-Inch Telescope Dome, Mount Wilson Observatory, Sunday 6 May 2018, 3p.m. and 5p.m. 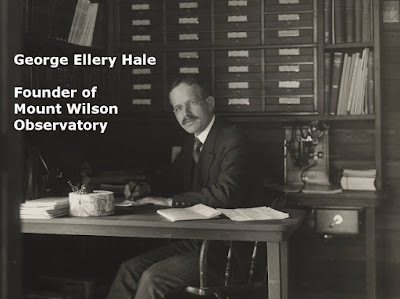 Photos: The performers, the observatory, and George Ellery Hale: Courtesy Mount Wilson Observatory; Saint-Saëns: Courtesy schubertiademusic; Jacques Ibert: Louis Silvestre, Courtesy Wikimedia Commons; Bruce Broughton: Composer website. Emerging victorious from the Finals of the 46th Annual Edith Knox Performance Competition, held on April 8 under the auspices of the Peninsula Symphony, pianist Victor Shlyakhtenko gave his first concert as winner at the May “First Fridays at First!” recital. The audience enjoyed a formidable display of pianism, played entirely from memory by the 16-year-old virtuoso, though I did regret the late substitution, at his teacher’s instigation, of the two complete works originally billed (Chopin’s Third Piano Sonata and Polonaise in A-flat major Op.53) by a program mostly of extracts. I suppose you could argue that any one of the “48” Preludes and Fugues is also an excerpt from a larger whole, but no-one would suggest that Bach’s The Well-Tempered Clavier is a single musical entity in the way that Beethoven’s “Appassionata” and Chopin’s Third Piano Sonata are. So the Prelude and Fugue in A minor BWV 865, the 20th in Book One of Bach’s mighty double survey of all the major and minor keys, made a fine and unexceptionable recital opener. Mr. Shlyakhtenko took the brief Prelude, all over in less than a minute, at quite a fast tempo, and thus very clearly marked it off from his spacious account of the following Fugue, where the voice-leading of the four successive fugal entries, and delineation of the unfolding contrapuntal lines, were handled with impeccable clarity. He followed this with the first movements each of Beethoven’s Piano Sonata No.23 in F minor Op.57 “Appassionata” and Chopin’s Piano Sonata No.3 in B minor Op.58. Of the two, the former seemed to me the more successful, Mr. Shlyakhtenko hurling out Beethoven’s sudden fistfuls of fortissimo chords in the exposition with all the energy and passion the composer demands, while still observing the sudden contrasts of dynamic down to pianissimo with which the score abounds. The whole movement was grippingly done, and it seemed simply wrong for this performance to stop at its conclusion (not quite down to the ppp specified, and elsewhere with Beethoven’s occasional dolce markings a little under-observed) and not proceed to the Andante con moto and finale. I wish I could be as enthusiastic about the Chopin, but – firstly – it’s surely a mistake to omit the repeat of the long exposition, particularly as he takes the trouble to write in two first-time measures. Secondly, there was throughout, to my ears, a want of nuance. 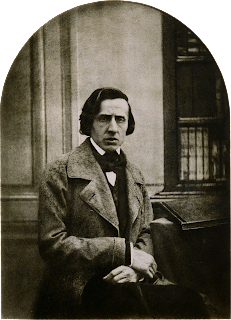 Unlike the Beethoven, in this movement Chopin’s dynamics hardly ever move above forte or below piano, and with little tempo change from the opening Allegro maestoso. 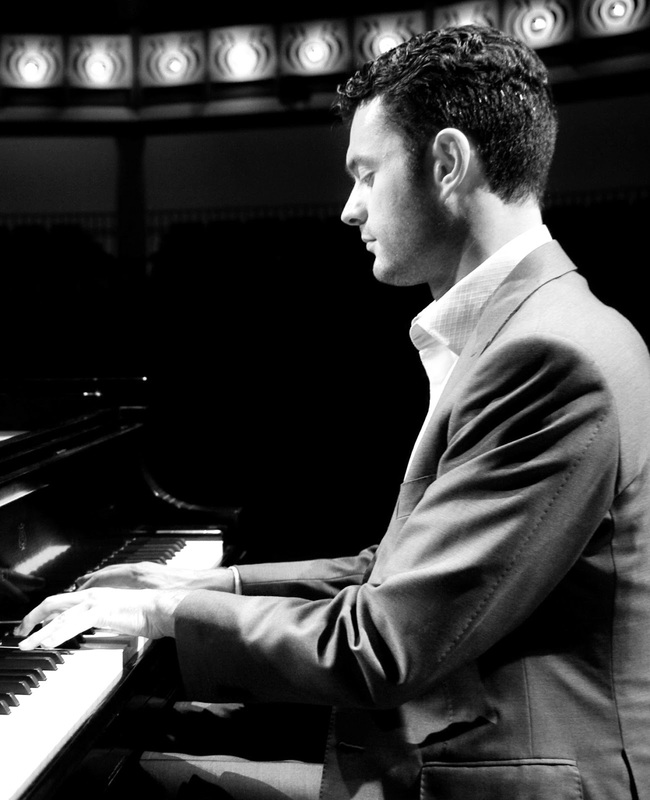 To observe and express the ebb and flow between these quite narrow parameters, and avoid the rather dogged middle-ground mezzo-forte that pervaded much of the performance, requires a subtlety of gradation that I am sure will come to this pianist with greater maturity. 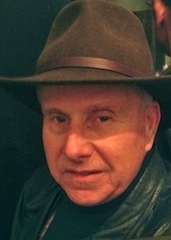 Finally, came an unannounced encore, a steel-fingered virtuosic account of – what? Speculation raged afterward in the queue for the complimentary coffee and cookies that Classical Crossroads Inc. generously lays on for the First Friday concerts... Just kidding, though my guess of Shostakovich was echoed by another attendee, while someone else opined Bartók. Nope, all wrong. 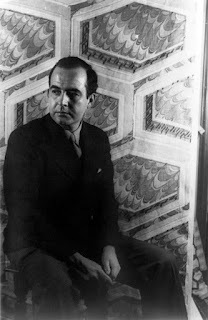 Later inquiry revealed that it had been the finale of the Samuel Barber Piano Sonata in E-flat minor Op.26, the acerbic fugal energy of which would come as quite a shock to anyone whose knowledge of the composer was confined to the Adagio for Strings and the Violin Concerto. As with the Beethoven, I would love to hear Mr. Shlyakhtenko play the whole Barber Sonata. 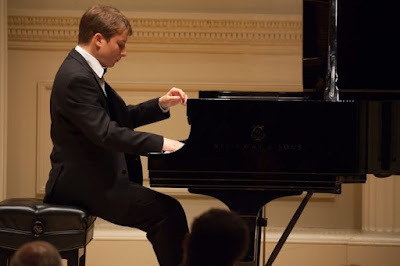 However, he will be appearing as soloist in Liszt's Piano Concerto No.1 in I-flat major with the Peninsula Symphony under Maestro Gary Berkson on Sunday, June 17 at Redondo Union High School, 222 North Pacific Coast Highway, Redondo Beach. “First Fridays at First!”: First Lutheran Church, Torrance, 12.15pm, Friday, May 4, 2018. Photos: Victor Shlyakhtenko: Courtesy Lang Lang International Music Foundation; Chopin: Louis-Auguste Bisson, courtesy Wikimedia Commons; Samuel Barber: Carl Van Vechten/Library of Congress. Planning a concert season must be a challenge at best, and a nightmare at worst. You have to balance a whole range of issues musical, human, and practical: achieving an overall coherence but still plenty of variety and avoidance of monotony; the acoustics and other practicalities of your venue(s); the availability of performers when and where you require them; their preferences vs. yours over works to be performed; your audience’s sensibilities and willingness (or not) to take a chance on unfamiliar music; the need to keep your Board and sponsors happy; and so on. This final concert of the SBCMS 2017-2018 series – given by pianist Steven Vanhauwaert, violinist Movses Pogossian, clarinetist Michele Zukovsky, and ‘cellist Antonio Lysy – also marked the end of Gary Gordon’s term as the Society’s Music Program Director, and so it’s appropriate to tip the hat here to his skillful planning of these concerts. Judging by those I’ve been around to enjoy over the last couple of years, they have achieved a remarkable range across the seven concerts per season, with the highest standard of performance throughout. This last program was one of Gary’s most adventurous, my only reservation being that the second and third of the four items comprised individual movements extracted from larger wholes, which I don’t much care for; in each case, however, there were extenuating circumstances. The 50-minute eight-movement entirety of Messiaen’s Quatuor pour le fin du temps (Quartet for the end of time) would occupy some two-thirds of a normal-length chamber concert and so – given also that some might find his very personal idiom somewhat challenging – it was reasonable to give a substantial flavor of the work through its first, second, and fifth movements only. As Mr. Vanhauwaert explained, the Quartet’s very unusual scoring for violin, clarinet, ‘cello and piano was of necessity. 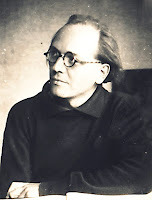 These were the only instruments available to Messiaen during his 1940-41 incarceration in a German PoW camp, but despite the privations he managed to compose the work (or rather, complete its assembly around some individual movements written both before and after he arrived at the camp) and it was premiered, to an audience of the prisoners, in January 1941. I admit that Messiaen is not my favorite composer: for me, his brittle sound-world, swinging between clattering activity and stasis, rapidly becomes tiresome, and the pervasive religious imagery that underpins and overlays it, stemming from his devout Catholicism, more than a little oppressive. 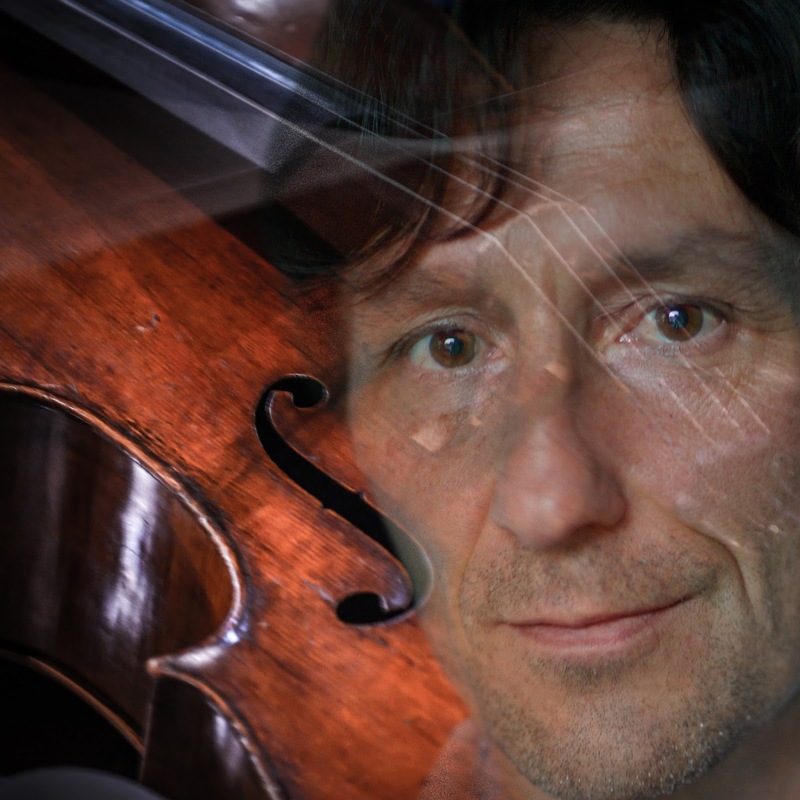 But that said, his originality is undeniable, and the unique style of the piece was vividly projected by the players – all four of them in the calm, preludial Liturgie de cristal and the apocalyptic second, Vocalise, pour l'Ange qui annonce la fin du Temps, movement and, most impressively, by the ‘cellist and pianist in their long duet that comprises the fifth movement Louange à l’Eternité de Jésus… where Mr. Lysy stopped playing a few seconds in to await absolute silence before beginning again his long Infiniment lent, extatique meditation. He got it. 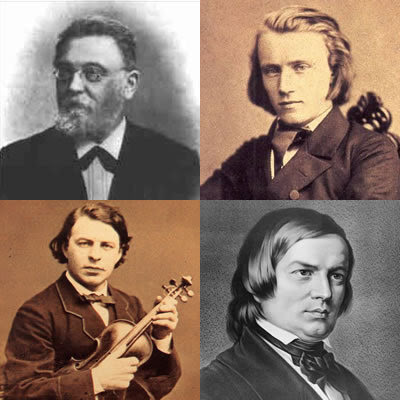 Clockwise from top left: Dietrich, Brahms, Schumann, Joachim. 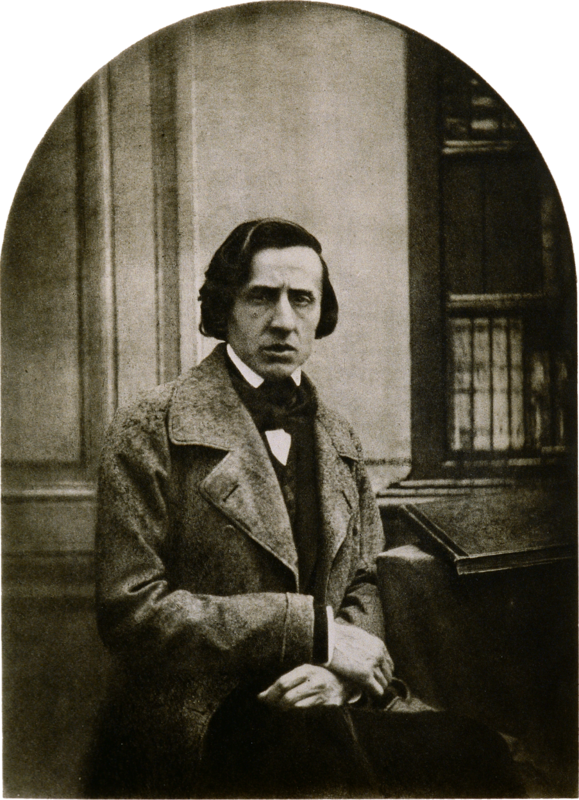 Following the Messiaen, Mr. Pogossian gave an exceptionally warm and engaging introduction to the 1853 F-A-E Sonata for Violin and Piano, devised by Schumann as a birthday gift to the violinist Joseph Joachim from himself and two young protégés, Albert Dietrich and Johannes Brahms. (F-A-E stands for Joachim’s personal motto Frei aber einsam (free but lonely), and as a musical motif permeates the piece.) Dietrich contributed most of the compositional heavy lifting with a wide-ranging sonata-form first movement, while Schumann wrote the brief Intermezzo second movement and more extensive Finale, and Brahms filled out the four-movement scheme with a rumbustious Scherzo that enfolds a fulsome Trio section. Less forgiveness here for the excerpting: the whole piece lasts only a little over 25 minutes so it would not have made for an inordinately long concert to have played all of it, and the tenderness and fiery attack with which Messrs. Vanhauwaert and Pogossian played, respectively, the Schumann Intermezzo and the Brahms Scherzo only made the loss of Dietrich’s and Schumann’s outer movements the more regrettable. That said, the multiple authorship of the work negates any idea of them being torn from a unified conception, while the Brahms at least was published, and is performed, as a standalone piece. The concert was bookended by the two complete works. 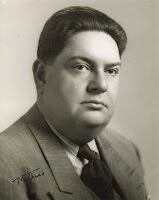 The four movements of Darius Milhaud’s 1936 Suite for Violin, Clarinet and Piano are all over in 11 minutes or so, and it made the perfect opener: its charm, amiability and effervescence are worthy of Milhaud’s slightly younger French contemporary, and fellow-member of composer group Les Six, Francis Poulenc, and the absence of that composer’s harmonic piquancy only made the Suite’s overall effect even sweeter. It’s salutary to reflect that its already impressive opus number of 157(b) stands well under the half-way mark in Milhaud’s colossal output; what other treasures lie concealed therein? 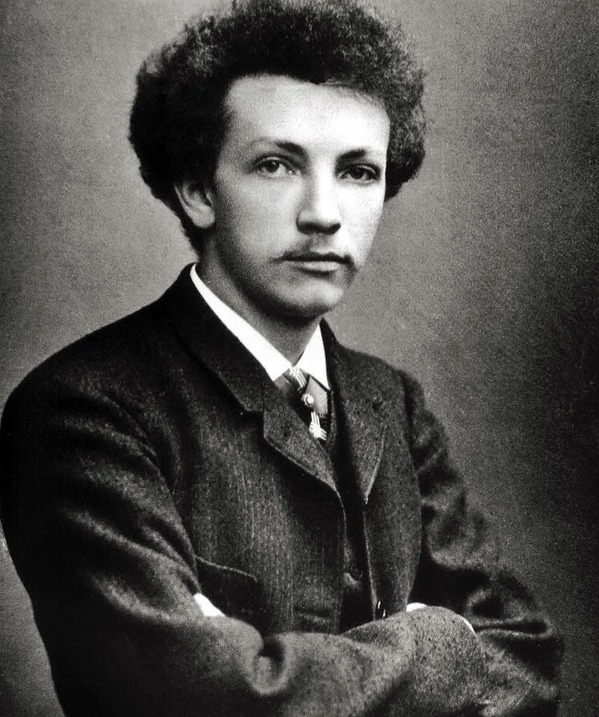 The second half was entirely taken up by one of the quartet of late Brahms masterpieces inspired by the playing of the clarinetist Richard Mühlfeld. This was the Trio in A minor for Clarinet, ‘Cello and Piano Op. 114, the concision of which, especially lacking as it does a repeat of the exposition in the first movement, emphasized how practicable it would have been to include the whole of the F-A-E Sonata. This performance was more forthright than some I have heard, but the players still gave full value to the contemplative qualities that justify the “autumnal” epithet so often ascribed to these works, and which Mr. Vanhauwaert duly noted in his prior remarks. Even in the waltz-time Andantino grazioso that does duty for a scherzo, Brahms doesn’t lift his feet far off the ground, and while the brief Allegro finale starts with plenty of propulsive energy, it incorporates much reflective pause before rousing itself to a positive conclusion. 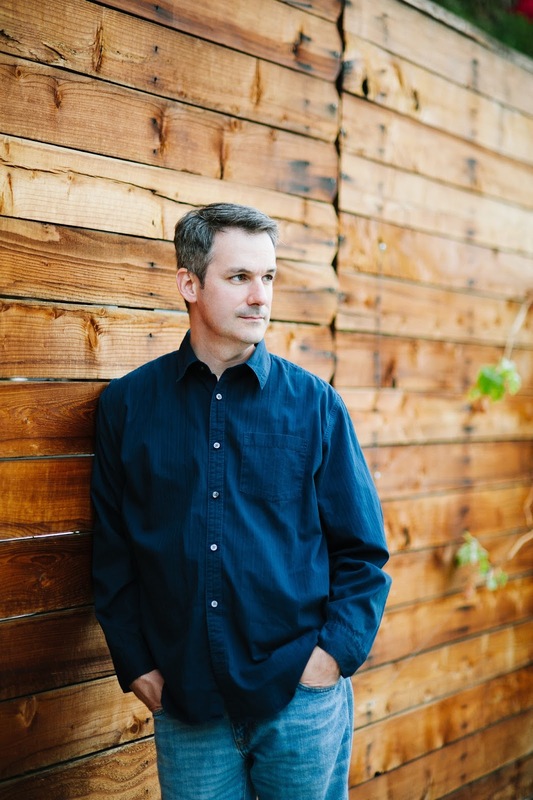 However, while this 55th season of the South Bay Chamber Music Society may have ended musically with the grave thoughtfulness of Brahms in his final years, its last concert had begun in a mood of optimistic anticipation, with new Artistic Director Robert Thies outlining the seven concerts he has planned for the 2018-19 season, opening with the unusual forces of a wind octet, no less. Clearly there is much to look forward to! 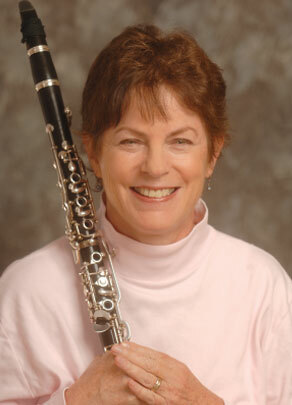 South Bay Chamber Music Society, Pacific Unitarian Church, RPV, 3pm, Sunday, April 28, 2018. Photos: Steven Vanhauwaert: website; Michele Zukovsky: Courtesy Summit Records; Movses Pogossian: Lawrence K. Ho, LA Times; Antonio Lysy: Clara Lysy; Messiaen: Courtesy Chicago Symphony Orchestra; Dietrich/Brahms/Schumann/ Joachim: Courtesy tumblr; Milhaud: Courtesy allmusic; Richard Mühlfeld: Courtesy Antiquariat Thomas Rezek (Munich, Germany).